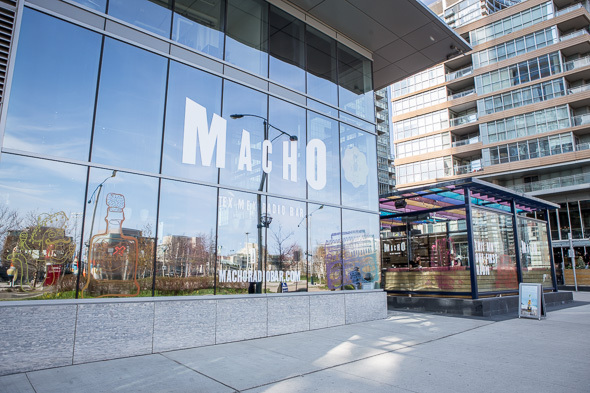 Macho Radio Bar is a casual Tex-Mex joint that occupies the space formerly home to Citta in CityPlace. Owners Hanif Harji and Charles Khabouth (the duo behind Patria, Weslodge, Figo and NAO) have done a total 180 from the previously precious Italian concept that stood here before. 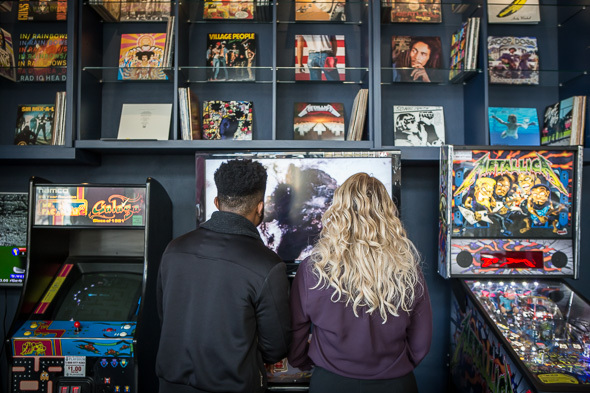 The space, revamped by Studio Munge, boasts a lively atmosphere scattered with high-top tables and outfitted with arcade games and neon lights. The bar top, treated as a shadow box, displays colourful artifacts and art objects nestled into red velvet, while built-in shelving houses an enviable record collection. 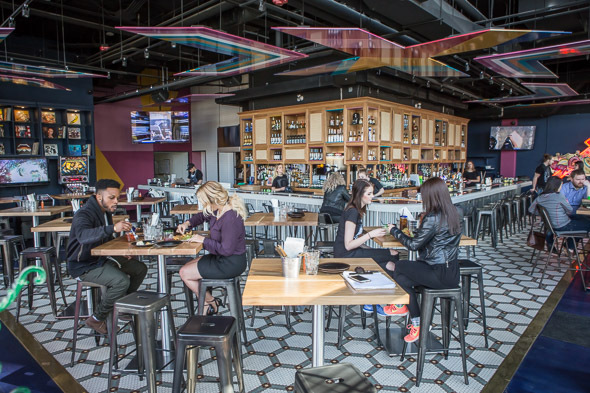 Inside, there's seating for 85, but more attractive still is the enclosed patio with room for 100. 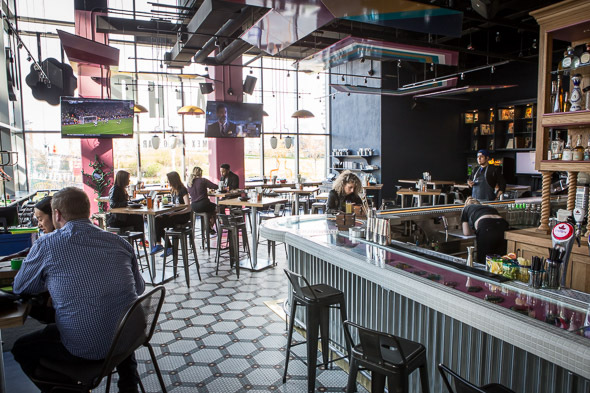 Patio-friendly libations are the house specialty, and you'll find everything from slushie-style margaritas ($8-$20) and customizable agua frescas ($8/glass) to pitchers of sangria ($25) and an impressive lineup of tequilas and mezcal. 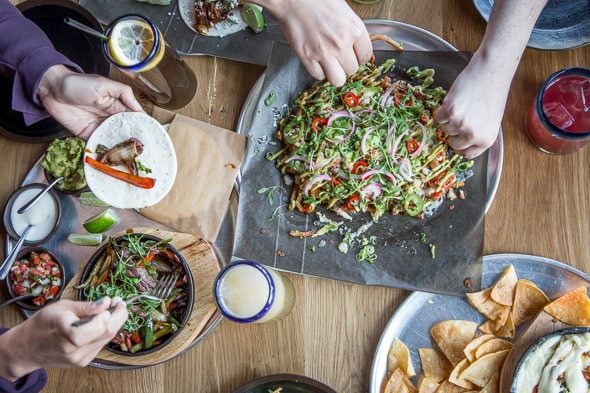 To eat, the menu from chef Guillermo Hebertson (previously at Barsa Taberna) features fun Tex-Mex bar foods each priced at $20 or less. Macho Fries ($10) are an upscale answer to fries supreme sans the waxy orange cheese sauce. 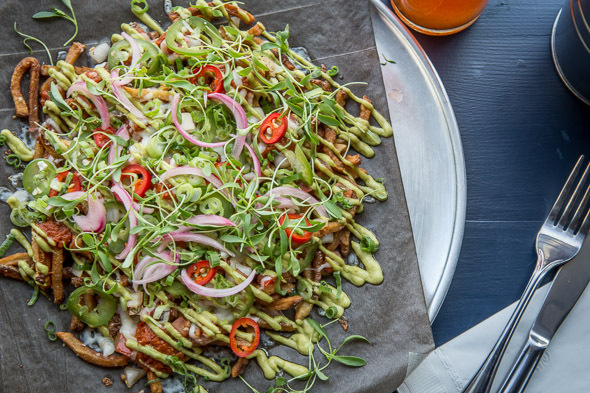 The standard order is vegetarian and starts with a base of thin-cut fries loaded with an avocado-based green goddess aioli, cilantro, salsa, jalapenos and queso. Chorizo for $2 more is optional. 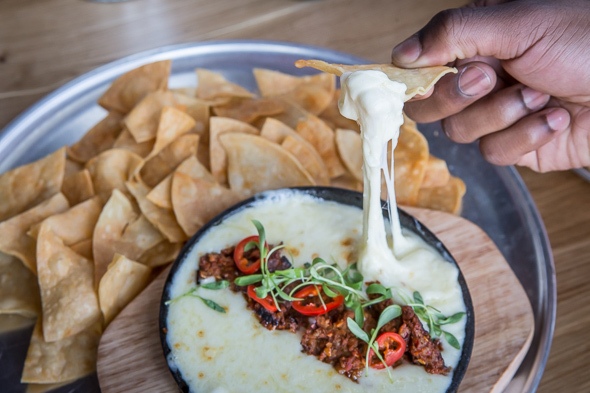 The chorizo queso fundido ($10) is a take on Hebertson's mother's recipe. It's a mass of stringy melted mozzarella with a little white wine reduction for added acidity. Topped with crumbled sausage and pickled anaheim chiles, it's a fun dish to devour with tortilla chips. The Santa Fe salad ($8) is far heartier than anticipated. 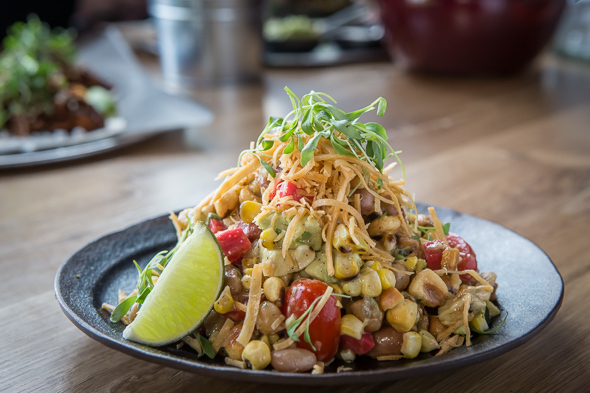 The medley of charred corn, chickpeas, romano beans and cherry tomatoes is studded with radishes, fried tortilla chips and corn nuts for crunch. Avocado adds a little creaminess, while a smokey onion and lime vinaigrette gives it a little punch. 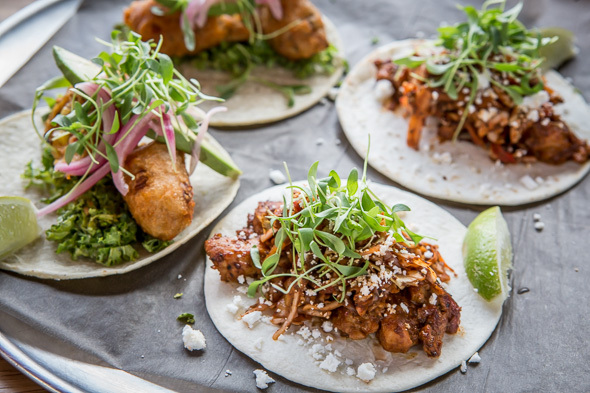 Tacos in five varieties all under $5 include options like the vegan corn quinoa fritter dressed with kale and avocado crema. On the meatier side, there's grilled chili chicken marinated with tamarind, ginger and garlic then loaded with fermented guajillo slaw and cotija cheese. Even more intriguing are the fajitas ($14) which everyone at my table (myself included) consider a scarcity in Toronto (likely last consumed at a visit to LoneStar). 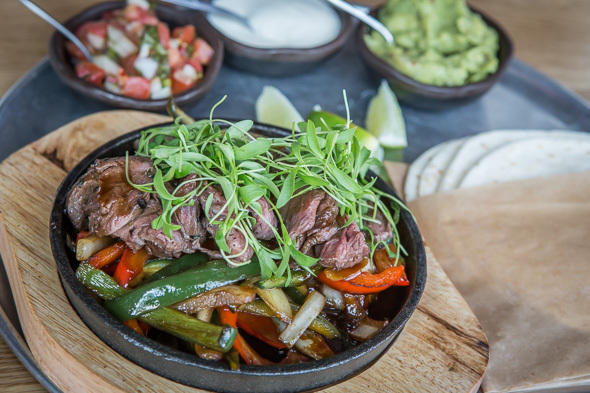 Here the platter is offered with a choice of hanger steak or chicken served in a sizzling skillet with peppers and onions. A pile of tortillas on the side with pico de gallo, guacamole, sour cream and hot sauce are best assembled at the table, and while the portion is fit for a single entree, it goes a long way towards accommodating a big group at snack time. 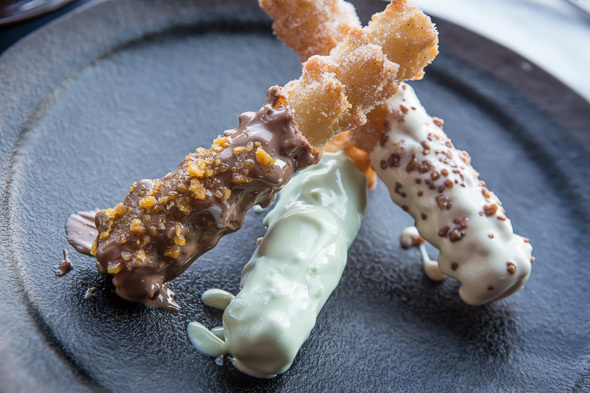 For dessert, the noteworthy options include churro ice cream sandwiches ($6), deep fried apple em-pie-nadas ($6) and dipped churros (three for $5) in mix and match flavours including dark chocolate, salted caramel, vanilla pop rocks and lime margarita. 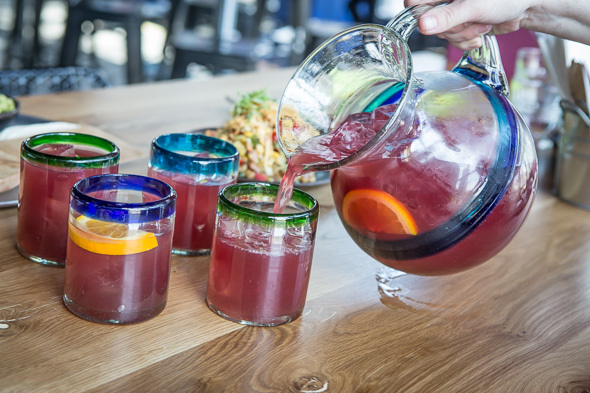 Rotating specials like pitchers of sangria on Sundays for $20 sound pretty seductive. 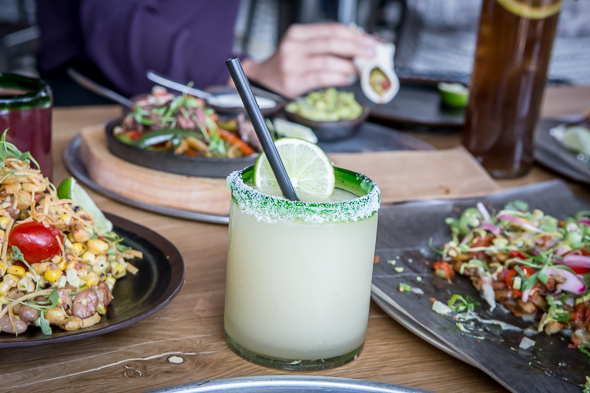 That's in addition to the weekend brunch menu featuring micheladas, breakfast burritos and huevos rancheros.